Can anyone explain to me why the following occurs (See image below)? Both supply the same constant 3.3V and after the project is uploaded it runs with the pins connected as in both scenarios. This will not work for the same reason you can not measure the voltage of a battery by only connecting the measurement device to the positive battery terminal. You always need a ground reference. Perhaps you were thinking all grounds, no matter where they come from, are the same. This is only true if all your power supplies are grounded. But this is usually not the case. In fact it can be dangerous and can lead to other problems such a ground loops. So, connect your grounds together and try your circuit again. You must always connect the grounds. Without the grounds connected, even when using a separate power supply, there can be no circuit. With no circuit, no electrons can flow. I cover it in detail in this blog post. 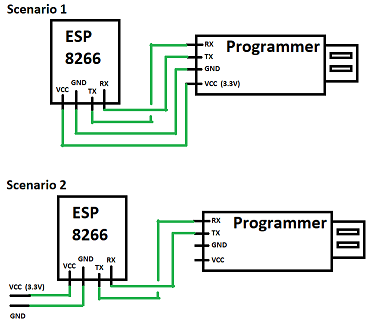 There's no problem with supplying a separate power supply to the ESP8266 but you always need to connect the grounds between the "programmer" and the ESP8266. Not the answer you're looking for? Browse other questions tagged esp8266 power uploading or ask your own question. Is it safe to use the same power source for Arduino and its Motor shield?